GOLD- Well, not a merry Christmas for Gold buyers just yet. We have said in our TMTF forecast service to watch 1190 as KEY support and 1241 would also need to be taken out on a closing basis before we could confirm a new uptrend in Gold and the end to the 5 wave bear cycle. Not quite yet, and in fact in my stock service we have avoided Gold stocks entirely even with the recent temptations to get long because Gold to us is key. If we are not over 1241 then we are not buyers of Gold equities, plain and simple. With 5000 stocks to choose from, why not stick with the sectors that are in the stronger uptrends and avoid those mired in the mud like Gold? For example you could be looking at Security stocks given all the cyber attacks worldwide that are only getting worse. Gold is money as we all know, but a downtrend is a downtrend. Trust what you see, not what you think for best results. So right now the problem is we just gave up the 1190 support and the 30 week MA line on the weekly chart is your guide for key resistance to take out. We remain in the sidelines until its taken out. The chart below shows the blue line with the 30 week Moving average resistance, and you can use this same chart for the uptrend in the SP 500 which we have used recently for our subscribers as well. Don’t suffer from history bias and the hay days of Gold stocks and Gold, which ended in 2011…wait for the next Hay days to arrive, watch the 30 week moving average line before acting. The SP 500 meanwhile is in wave 3 up from 1973 38% shallow wave 2 lows. That was a quick correction and the waves now are likely to be faster and shorter as we are in Primary wave 5 of this bull cycle, the last stages of the Bull if I’m right. 2131-2138 is your bogey ahead for first Fibonacci pivot resistance on the way to the 2181 target I had out over a month or so ago. http://www.themarkettrendforecast.com/wp-content/uploads/2013/08/TMTF-word-header.jpg 0 0 admin http://www.themarkettrendforecast.com/wp-content/uploads/2013/08/TMTF-word-header.jpg admin2014-12-23 08:56:272014-12-23 08:58:07Gold Still In Bear Cycle? Over the past 5 calendar years we have seen GOLD either complete an intermediate cyclical top or bottom in each February. 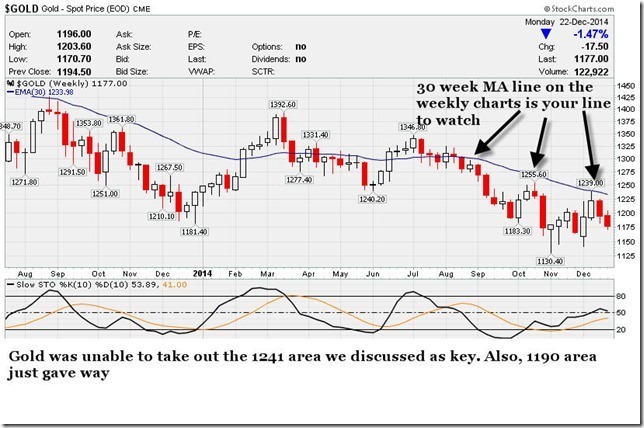 My forecast was for February of 2013 to be no different and for Gold and Silver to make trough lows this month. With that said, I did not expect the drop in GOLD to go much below $1,620 per ounce at worst, but in fact it has. Where does that leave us now on the technical patterns and crowd behavioral views? Obviously this chart shows oversold readings in the lower right corner using the CCI indicator. That said we would like to see 1550 hold on a weekly closing basis to remain optimistic for a strong rebound. In recent articles and forecast updates for my subscribers, I have been preparing them for a top in Precious Metals and US Markets around Mid January. We may have already seen the intermediate top in Gold and Silver recently, and the SP 500 and US markets are not far behind. and a little ahead of the curve when my crystal ball is clear. I look at Sentiment readings, Elliott Wave patterns (As I view them), and Fibonacci relationships and time. If all of these are lining up to give me enough evidence of a convergence and a bottom or top, then I go ahead and make the call or begin to forewarn. In the case of Gold, we see a really muddy chart pattern over the last several weeks that to me can only be read as toppy after a near $390 rally off the February lows this year. There are no clear Elliott Wave patterns anymore over the past few weeks, and the recent drop from $1422 to the $1360 ranges also doesn’t compute well for me if I’m a bull. I have been on the long side of Gold since February of 2010, with the one intermittent bearish call I made in June before a huge drop. It looks like now is a good time for Gold and Silver to pause in the long uptrend, which still has about 3-4 years remaining if I’m right. This next pullback is likely to take Gold down to $1270-$1280 and then I will assess from there the next direction and price action. As you can see in the chart below, the recent action is toppy looking and could be read as bearish. The SP 500 as I have outlined near year end 2010 is in the final stages of the advance from the Summer lows of 1010 on the SP 500 on July 1st. The Fibonacci and wave relationships then have been quite symmetrical and I see no difference on this final leg up. The difficulty is assessing whether this final 5th wave to the upside will extend past my 1285 targets and run to 1315, or truncate just below and begin the correction. I am looking for about 105 points SP 500 correction from the 1285-1315 topping areas over 7-10 weeks. This too will work off extremely bullish sentiment readings which are running at or near the same highs as the January 2010 and April 2010 highs which I had forecasted as well. The areas that would be hit hardest in the coming wave 2 correction will be small cap stocks, so lightening up in that area and buying protection is not a bad idea to protect your long portfolio positions.